Most of the time, when people contact me about photographing their intimate wedding or elopement, they have no idea what they want their day to look like. I absolutely LOVE working with couples in this dreaming and planning stage of envisioning what their wedding day could be, and enjoy sharing any experience or advice I have that could help make their vision happen. I fully believe that intimate weddings & elopements are the absolute best way to get married. In addition to only having the people that you are closest to witness the powerful and personal moment of committing your life to your partner—you have the freedom to create whatever kind of wedding day is the most "you." Joy, Clint, & I went through so many different ideas, locations, and visions and we were still chatting and collaborating a week before their amazing elopement. 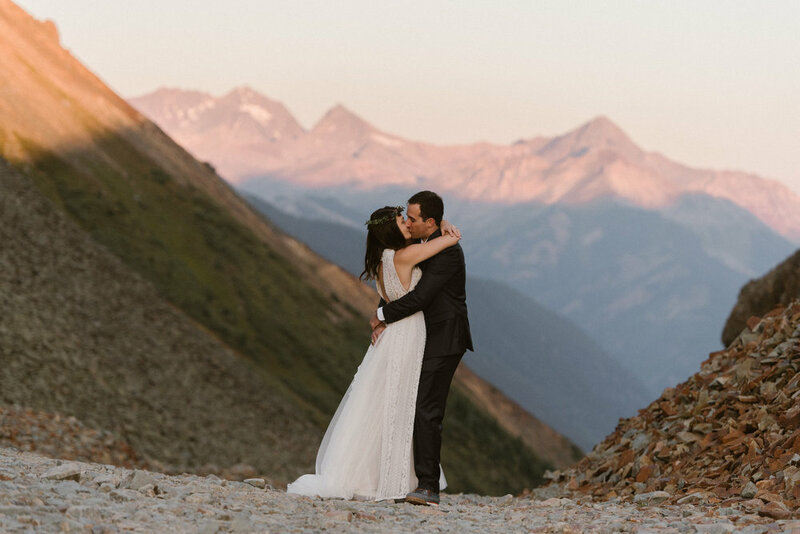 They ended up driving Ophir Pass the day before their elopement and deciding that's where they wanted to do their "first look" at sunrise and exchange gifts. I absolutely love the spontaneity and freedom that intimate weddings entail—each couple can create their own adventure and design a day that truly reflects their relationship. On Joy & Clint's wedding day, we met before sunrise, headed up a fun & sketchy 4x4 road in the dark, and reach the top of the pass just as the sun was starting to turn the mountains pink. Joy changed into her dress at the back of the Jeep, and they saw each other for the first time in their wedding attire just as the sun burst over the horizon and began their incredible adventurous wedding day. They cuddled & cried, danced, and gave piggy back rides all over the top of the pass, and then we drove back into telluride to meet the family for their ceremony. We headed up Telluride Ski resort via the gondola, and they said their vows with their closest family members at San Sophia Overlook. We rode the gondola back down, hopped back in their Jeep Rubicon, and headed up another 4x4 road to Bridal Veil Falls. They wrapped up their day cuddling under the mist of the tallest free-flowing waterfall in Colorado—everything was so perfectly "Joy & Clint." Inviting me to be a part of your elopement means more than just photos. If you're planning your own elopement adventure (in Colorado or elsewhere), get in touch and I'd be happy to share location, suggestions, and other planning ideas.